This is in memory of a very special cat that broke our hearts. At the time we were catless. We had lost all our old dogs to various old age illnesses. We hadn't decided if we wanted more pets since it was so painful to lose the three old dogs and we just gotten the RV and were traveling and camping quite often. But the house was so empty. So quiet with just the two of us. 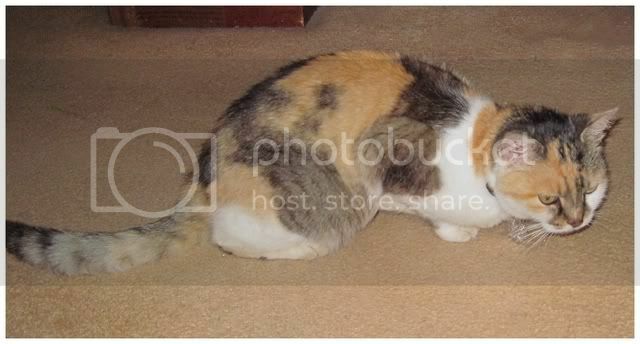 Then one day in May of 2009 someone dumped off an adult calico cat. I was outside in the garden when I heard her crying. I watched as she went through the fence to the neighbor's property where the young girl living there saw her. She and her mother took to feeding her and the girl dearly loved the cat. I was happy for them both. But then they suddenly moved that fall (they were renting a MH on the land) and I thought they look Lucky with them. But suddenly one day she showed up on our porch. She wasn't skinny so must have been able to hunt up enough to eat. But with the cold weather, there would be less prey. Less birds and baby mammals to feed on. I opened the door and let her in, surprised to see her. I knew the young lady loved this cat and found it hard to believe they would leave her behind. I offered her some raw steak and milk and she seemed happy to get it.. and off to town I went for cat food and litter. She was snoozing under the table. For the first week she did fine but on the 7th or 8th day I woke up to find her in the hall with her head twisted to the left. She could not straighten her head to drink or eat or get in the litterpan. It stuck me than that things were odd about her before that morning and I already had an appt with the new vet to see her. I called as an emergency case and they took her in as soon as the clinic opened. She got a thorough exam and I was told she was healthy but had an inner ear infection, was given antibiotics and some other meds for her. The next 6 weeks were an exercise in frustration, emotional rollercoastering and pain, expense and worry. We did all we could for her but she would rally and be able to eat for a day or two then the head twist would return. It was up and down until the night I got up and found her in the bathroom having a seizure. Back to the vet again in the morning. By then we were deeply attached to her, but she wasn't "all there." The vet insisted on it being an inner ear infection but this cat couldn't go on living like that. By then I was force feeding her and she couldn't use the litterpan anymore as all she could do was walk in circles to the left. 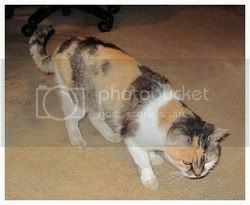 She never once groomed herself and so I believe Lucky was sick the day she came up on our porch. She never ventured out of the diningroom. That in itself was odd. I will always remember this sweet girl named Lucky and wish we could have saved her. Oh my gosh that is so heartbreaking I really am in tears hearing this. These situations make me believe there has to be a better afterlife for all, once we're done all the sadness/madness earth can dish out. She is such a gorgeous baby. I'm so deeply saddened by your loss. It really hurts like heck, I know, to lose a precious gift of a furry baby. In '08 we lost our 1st boy furball to renal fail, & he too was gotten as a semi-stray. It hurts yet to think of him & his pain/suffering. Please let let me pray for you & her, & know that Rainbow Bridge is where you'll meet again. May God Bless her & you. Pease know you aren't alone in this mourning as I'm sure I speak for all on here, that we cannot ever feel good to hear of a loss that you know in your heart, you wanted to prevent so badly. May God watch over you both til you meet again. So sad. Thank you for trying to care for this poor little girl. she was so beautiful and smart. She knew who to turn to for help. Sorry it was not to be but she died being cared for and not alone.